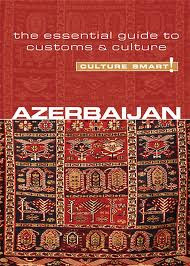 I never wanted to get into the culture/tour guide book, but I boldly went into that territory when I chose a book about Azerbaijan. There were a couple of considerations which led me to this decision: 1.) 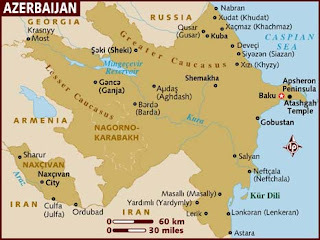 I had never before heard of Azerbaijan and didn’t have any particular attachment to this country; and 2.) there were a limited number of affordable books which focused solely on this country. When I started this challenge, I also purchased the books I read. As time went on, I realized that if I continued this trend, I would eventually be the owner of a pretty epic library. The Azeri language has throughout history been written in three different scripts: Arabic, Cyrillic, and Latin script. We can see how these languages mirror the history of the country with its influences from Iran, Russia, and the West. Azerbaijan celebrates March 31 as the National Genocide Day. In 1918, Armenian troops massacred Azeris. This fact interested me greatly, and I would love to get more information about this conflict. After reading a book about the Armenian genocide, the idea that the victims becoming the perpetrators is a very interesting concept. Moreover, February 26 marks the day of the Khajali Genocide, which occurred in 1992 as a result of Armenian troops. To be honest, this book left me with more questions than answers. It gave me just enough information about Azerbaijan that I began to develop questions. For example, I have a desire to learn more about the genocide conducted by the Armenians and its importance to Azerbaijan. I would also like to know more about the Azerbaijan oil-based economy, how this has affected its relationships with the outside world (including the West), and the efforts to diversify it. Thank you, Vusal, for your communication and your willingness to answer my questions regarding the economics and the political atmosphere of Azerbaijan! I feel like your answers have given me an even greater appreciation for your country.